Whether you are a novice looking for your first taste of kayaking or whether you have previous experience and want further training then I have a course or program that will suit you. Locally, there is potential for learning kayaking skills using local inland waterways or, for the more experienced paddler, longer river journeys can be undertaken further afield. The typical sea kayak is longer and more streamlined than a general purpose kayak. It also has bulkheads and waterproof compartments for storing equipment. This makes it ideal for journeys and multi-day expeditions on the sea. 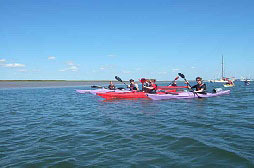 The coast of East Anglia with its many tidal estuaries and backwaters is an ideal place to learn sea kayaking. 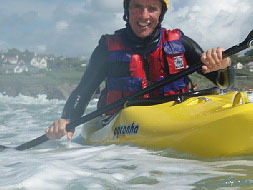 For novices or those who are new to sea kayaks I can offer the Introduction to Sea Kayaking Day. For those who are experienced I can offer a variety of courses learning more advanced skills and rescues, rough water handling skills and negotiating fast tidal streams and overfalls. Coastal Navigation can also be one of the main focuses of a day on the sea. For those who want to do coastal journeys and exploration then there are a number of interesting possibilities both locally and further afield. One example is the Walton Backwaters Sea Kayak Day. In the spring I will be running training days for children where safety and fun will be the main topics. Let me know if you want more information. If you want any kind of adventure with kayaks please contact me. Trips and courses can be made to suit your requirements. James' introduction to sea kayaking is just that, covering everything from navigation to safety equipment to paddling techniques. James has years of experience to draw on and can put the most nervous of paddlers at ease, treading a perfect line between instruction and giving students free rein to practice new skills. And perhaps most importantly for a sea kayaking course.... it takes place on the sea! Just a quick note to say thanks very much for yesterday's course. Kay and I both really enjoyed it and it was just what we hoped it would be. Dear James. Just a quick note to thank you for an excellent day out and introducing us to the world of kayaking. I thoroughly enjoyed myself and would recommend the day to anyone who is thinking about giving kayaking a go.